Program Agenda: Ganesha puja, Sankalpa to sponsors, Avahanams, Mrityunjaya Japa (Moola Mantra), Ayushya Suktham, Agni Invocation, Ganesha Homam, Maha Mrityunjaya Homam, Ayushya Homam, Sri Suktham, Purna Huthi and Namaskaram process. Why Maha Mrityunjaya Ayushya homam? Maha Mrityunjaya Ayushya homam helps to conquer over untimely death and other health disorders. This yagya is considered to be the King of all rituals which is mainly done for avoiding premature death and to increase the life span and is highly recommended for those people facing frequent misfortunes (accidents, untimely death etc.,) in life. Maha Mrityunjaya Ayushya Homam is very essential to get complete relief from disease caused by bad effects to extend the person life and Ayushya Homam is very helpful to remove the bad vibrations of previous birth (karmas of Past Life) to increase the life span, since this maha ritual consists of both Mrityunjaya and Ayushya Homam is considered to be the most effective yagya to receive complete divine protection against negative forces to achieve victory over death. 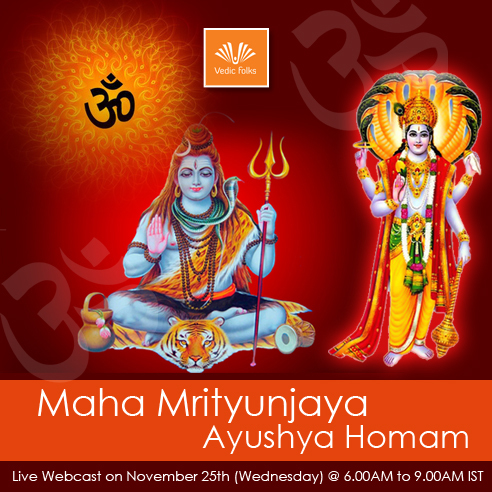 Maha Mrityunjaya Ayushya Homam helps us to rejuvenate vitality for longevity. Anyone who wants to prevent accidents, injuries and other major health disorders can choose this homam for obtaining optimum results. Rejuvenate the person who is fighting against death.Helps to recover from diseases which could not be diagnosed. Recover from frequent mishaps in life and attains victory over death. 1. Homam Prasadam from Yagna Center. 2. Free Energized Mrityunjaya Yantra. ( Mriyunjaya yantra protects you from untimely death and other health disorders). Assistance from Vedic Folks: We at Vedic Folks are proud to possess the most authoritative experts who have the knowledge and ease to invoke these powerful radiations which can bring exact results and all kind of fortunes in life! Participate Now - We accept 4 name Sankalpam for single Order !